Discover Technologies participated in the 2014 TifloInnova Accessibility Technology Fair, November 21st through November 24th, 2014 in order to introduce its accessible software, Discover Access for SharePoint™, into the Spanish Market. TifloInnova is a conference sponsored by ONCE, Spain’s National Lottery funded organization that assists blind and visually impaired people in all aspects, at a national level. More than thirty companies participated in this third version of the fair which occurs every three years. Thousands of visitors attended the fair, many from neighboring and distant countries. 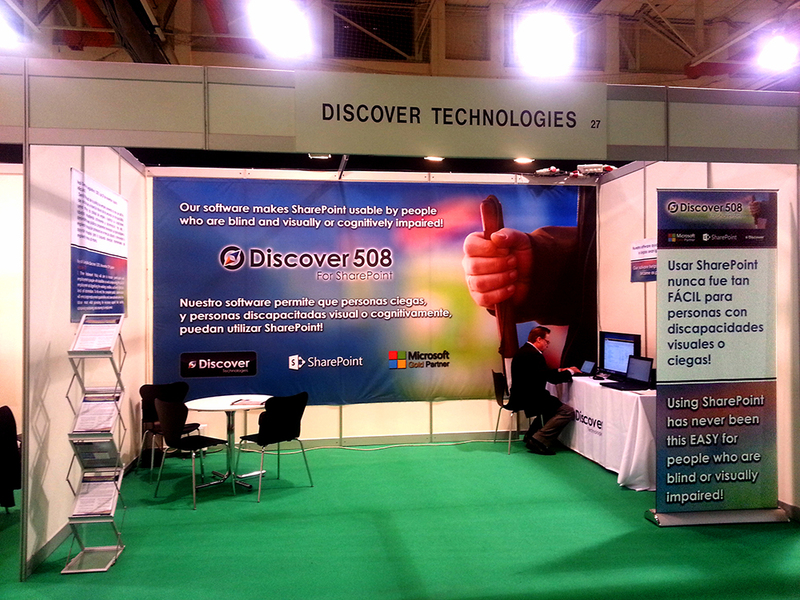 Discover Technologies made its debut entrance in TifloInnova in a very professional, appropriate and prominent manner. The design of the large banners, handouts, and brochures complemented each other’s design and served their purpose in more than one instance as visitors who knew SharePoint were drawn into the booth. The booth’s design allowed people from all ages and backgrounds to enquire about our product, learn about SharePoint, and spread news about both SharePoint’s accessibility problem and newfound solution. The fair was very successful and is definitely something that should be replicated worldwide to create awareness, further product-development efforts, and most importantly, allow people who are blind or visually impaired to find solutions for their every day problems.